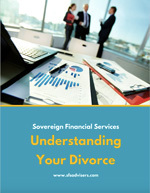 Sovereign Financial Services | Providing financial planning, retirement planning and much more in the Bel Air area. If you’re looking for solid financial advice from an approachable, family firm, we’re right for you. Book a time to join us for a coffee and a chat. We’ve got a full range of financial services that we can help you with. Just click on the area you’re interested in to learn how we can help. Tailored plans with no hidden agenda, to suit your individual circumstances. Retire on your terms. We’ll create the ideal plan to safeguard your future. We’ll give you stress-free support that you can build on. Protection you need, and nothing you don’t. Make decisions on your future in complete confidence. Going through a divorce is never easy. This guide will help you to understand the important financial matters that will prepare you for the future. 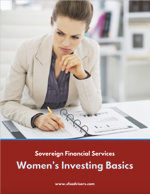 In this free guide, Melissa guides you through the do’s and don’ts, and tips and tricks of women’s investing. Plus get organizational worksheets to use straight away. If you’re worried about your existing plan, or just don’t know if it’s working for you, come and get some free and impartial advice from us today.